The herb stevia is natural, sweeter than sugar — and has no calories. People enjoy it around the world. Why won’t the FDA let you? While classified as a civil action, “the United States of America vs. forty cardboard boxes” had all the trappings of a big-time drug bust. It took place on a summer day in 1991, when a bevy of armed federal marshals raided the Arlington, Texas, warehouse of businessman Oscar Rodes, served him with a warrant, and proceeded to seize his most recent shipment. “They didn’t give me any advance notice or anything,” Rodes recalls. “They came in my office in the warehouse, and that’s when they showed me the papers” and “took everything away.” Rodes himself was not taken into custody. The arrest warrant was for the boxes he had just imported from South America, which contained some dried leaves and a white powder extracted from them. All this fuss over tea? Well, not just any tea. What Rodes had imported was stevia (Stevia rebaudiana Bertoni), an herb as remarkable as it is unknown in the United States. A perennial shrub of the aster family, stevia contains natural compounds-specifically, stevioside and rebaudioside A-that are estimated to be 150 to 400 times sweeter than sugar. Advocates claim that the herb also offers a host of health benefits, and is even a tonic for the skin. But here’s the clincher: Stevia sweetens without calories. While it tastes sweeter than honey, it’s about as fattening as water. Used for centuries in parts of South America, stevia has been discovered in recent years by much of the calorie-conscious modern world. It is now widely-and legally-consumed by millions of people, from the plant’s native Paraguay and Brazil to South Korea, Israel, and the People’s Republic of China. But no country has done more to demonstrate stevia’s dietary and economic potential than Japan, where the herb and its extracts have been used since the 1970s. The Japanese, having subjected stevia extract to extensive safety testing and found it without health risk, now incorporate it in numerous food products, including candies, ice cream, pickles, and soft drinks (including some reportedly manufactured by Coca-Cola)-products that might otherwise have been sweetened with refined sugar or chemical substitutes. In 1988, in fact, refined stevia extract commanded a 41 percent share of Japan’s multimillion-dollar market for high-intensity sweeteners-outselling even the ubiquitous American-made chemical compound NutraSweet. In the fall of 1994, the agency was forced to modify the alert after Congress passed the Dietary Supplement Health and Education Act, which allows the herb to be sold if it is formulated and labeled strictly for use as a “dietary supplement.” The agency still restricts stevia’s use in teas and other food products, however, and notes that any mention of the herb’s sweetening ability could bring its regulatory wrath. Indeed, a number of shadowy events involving stevia suggest just how far some companies are willing to go to keep the herb off the market. According to FDA records, for example, in the late ’80s representatives of an “anonymous firm” lodged a “trade complaint” with the agency, charging that the Colorado-based tea company Celestial Seasonings was using stevia extracts in four of its products. The FDA will not identity the firm, nor say how the firm knew that Celestial Seasonings’ teas contained stevia. As a result of the complaint, however, the agency began a full-scale investigation, after which Celestial Seasonings ceased using the herb-and then, according to documents obtained from the FDA, told the agency about other tea makers that were also using it. More significant, perhaps, is that one stevia marketer says an FDA agent specifically mentioned the NutraSweet Company as the source of the complaint against his product. The NutraSweet Company, then owned by G. D. Searle and now a Monsanto subsidiary, says it has not put any pressure on the FDA regarding stevia. This much is clear: The history of stevia is so riddled with questions and incongruities that the appearance of favoritism remains. As Arizona congressman Jon Kyl noted in a 1993 letter to FDA Commissioner David Kessler, MD., there is a belief among those wishing to market stevia that the agency’s import alert is really just “a restraint of trade to benefit the artificial-sweetener industry.” All of which, it should be noted, has done little to diminish the allure of this natural noncaloric sweetener. One indication of its appeal: Consumers, having heard about the herb’s properties by word of mouth, have been buying stevia-based “dietary supplements” and skin-care formulas and using them as sweeteners. Clearly, today’s FDA does not share Bertoni’s opinion-and to understand why stevia remains in bureaucratic limbo, one must understand something of the agency’s labyrinthine logic. The specific “problem” cited by the FDA in issuing its import alert for stevia is the fact that it considers the herb an “unsafe food additive.” Under laws passed nearly forty years ago amid concern over the use of chemicals in food, any substance deemed a food additive must undergo extensive and costly scientific study. Since 1970, the agency has approved only five major new additives, two of which are artificial sweeteners: aspartame (NutraSweet) and acesulfame K (Sunette). As it turns out, any food that is added to another food (or even to water, which the FDA can opt to view as a food) can be classified as an additive and subject to this strict review process. But there is an exemption-if an additive is “generally recognized as safe,” or gras. gras substances get that status by either having a long history of “safe” use in food prior to 1958 or being shown to be safe through scientific procedures. But there is also an opening in the law that allows “self- determination” of gras status, whereby the person selling the substance decides that it is generally recognized as safe, based on available information. This, in effect, is what Oscar Rodes and other stevia marketers did prior to the crackdown. The risk, as Rodes learned, is that the FDA can challenge that determination, which could put the ultimate decision in the hands of the courts. Other marketers have tried to obtain gras status for stevia through more formal channels. One of these is Lynda Sadler, president of Traditional Medicinals, an herbal-tea company based in Sebastopol, California. When her company’s supply of stevia was embargoed in 1990, Sadler opted to formally petition the FDA. Working with the American Herbal Products Association (AHPA), whose Stevia Committee she heads, Sadler enlisted Washington, D.C., attorney William R. Pendergast to persuade the agency that the marketing of stevia should be permitted, based on its having been used safely and widely in food prior to 1958. That kind of dismissive comment baffles Pendergast and raises the question of what the FDA is doing with all the information he has submitted. “I don’t even know that it was used in religious ceremonies,” the attorney says. “But, boy, that tells me that he hasn’t read the petition.” The FDA’s own import alert, in fact, would indicate a far greater level of awareness at the agency. “Stevia leaves . . . have been used throughout history,” the alert notes, “and the extract, stevioside, has reportedly been approved for use in foods in Brazil and Japan. The product is used in these countries as a table-top sweetener in virtually all food commodities. . . .” The run-around given to would-be stevia marketers might be excused as simply government-agency inertia. But other events suggest that the agency is judging stevia by a capricious standard. “Stevia has a political problem,” observes the Herb Research Foundation’s McCaleb. “The FDA took action against stevia not based on any proclamation by FDA toxicologists or consumer complaints, or any factor other than a trade complaint-that is, a complaint from a company that did not want stevia on the market and told the FDA to get it off the market.” And while the FDA may be less than forthcoming about the identity of that company, others who were stopped from marketing stevia say they believe they know who it might be. In 1985, Kerry Nielson was director of operations at Sunrider International, a nutritional-products firm then based in Utah, when, as he tells it, “our first problem came” in the form of a trademark infringement complaint filed by NutraSweet against a Sunrider item called Trusweet, which contained stevia-leaf concentrate. But it wasn’t the end of Sunrider’s legal problems with stevia. Not long afterward, Nielson says, the US Department of Agriculture was knocking on the company’s doors. “I thought it was strange,” he said, “because they asked specifically to see the stevia,” whereas previously “they would just go through and have a look at everything. . . . When we took them over to the area where we had the stevia, the inspector dug out a bunch of red tags and started slapping them on everything.” The stevia was embargoed and the company was instructed to cease and desist from any further production. When asked what the problem with the shipment was, the inspectors replied “suspicion of adulteration,” but declined to elaborate. Since that usually means contamination by mouse droppings or insect parts, says Nielson, “I thought it was curious that they didn’t take any samples with them. We then commenced to get lawyers to try and figure out what the real problem was.” It was an attorney based in Washington, D.C., according to Nielson, who eventually provided the company with some insight into the situation. The FDA, he notes, agreed to go along with that use, showing that the problem really “had nothing to do with adulteration.” Around the same period, Jim May’s Arizona-based herbal products firm, Wisdom of the Ancients, was also getting a lesson in the politics of stevia. He told me it was NutraSweet that had filed the complaint with the FDA. Whether it was written I don’t know, but they went in and demanded it be removed. He said, ‘Jim, if you’d be willing to stop importing it, there will be no written paperwork, it will be just verbal between us, nothing in your record that you’ve done anything improper. '” “At the time I was only selling maybe $100 or $200 [worth] a month . . . it wasn’t worth any kind of a hassle with them,” says May, who now offers a variety of stevia supplements and cosmetics. When asked if the FDA has been in any way pressured by NutraSweet in any of its actions against stevia, Rulis says he has “no knowledge whatsoever of any influence, so to speak, from aspartame producers in this regard.” And Richard Nelson, a spokesman for NutraSweet, says he is unaware “of any pressure we have put on the FDA regarding stevia.” “Show me some evidence,” he adds. When pushed to the wall about stevia, the FDA tends to fall back on a handful of studies that it says raise legitimate concerns about stevia’s safety. The first of these-which has never been successfully repeated- was performed on rats in 1968 by Joseph Kuc, a Purdue University biochemist, working with a researcher in Uruguay. Kuc, in a recent telephone interview, said that while he still “stands by the results we had”-that is, a finding of toxicity and a marked reduction in the number of young born and “restrictions in circulation to the extremities”-those results should not be interpreted as applying to humans consuming either stevia tea or its extract, stevioside. In short, although the FDA refers to this study as casting doubts on stevia’s safety, it is precisely the kind of research the FDA would question if it were submitted by a petitioner. Or as Mark Blumenthal, editor of HerbalGram, a publication of the American Botanical Council and the Herb Research Foundation puts it: “The FDA would laugh them out of the room.” But the agency has at least seen this study. Other research, supposedly raising “the theoretical possibility” that the herb might cause blood sugar to drop in some people with hypoglycemia, has also been cited by the FDA even though no one at the agency has actually read the reports in question. “We have attempted to get the studies, and thus far have not been successful,” concedes David Hattan of the FDA’s Division of Health Effects Evaluation, speaking of the research published in “small regional journals in South America.” Nonetheless, the agency felt confident enough to mention the herb’s possible hypoglycemic effect in a cautionary letter to a company planning to market stevia as a dietary supplement. Perhaps the most notorious “somebody” to spend several millions on testing to get a sweetener on the market is G. D. Searle, whose NutraSweet won FDA approval in the early ’80s amid a storm of controversy that has not abated. The original review process was marred by charges of doctored records and flawed experiments, a call at one point by the FDA’s chief counsel for a grand jury probe, and the recommendation by a panel of scientific advisers that the substance’s approval be delayed until concerns about brain-tumor tests could be resolved. Of all the complaints received by the FDA since 1980 under its Adverse Reactions Monitoring System, some 72 percent concern NutraSweet, with reports of headaches, dizziness, and vomiting common. Its manufacturer, however, continues to insist that, with the exception of people suffering from a rare condition known as pku, aspartame is harmless to the public-a position backed up by the FDA, which apparently views the consumer complaints with a skeptical eye. Stevia, however, appears to be another matter entirely. “It’s my understanding that there are questions raised by [the animal studies on contraceptive effects] that have not been resolved. . . . When we see a study-even if it’s a poor study-that implies the existence of an adverse effect that isn’t resolved, we have to be concerned whether that effect really could happen.” But what about the studies cited in the stevia petitions that would tend to “mitigate or contravene” the ones that so concern the FDA? One study, for example, conducted in Japan, involved nearly 500 test animals that were administered stevia extracts over a two-year period. According to A. Douglas Kinghorn, a University of Illinois pharmacognosy professor, the highest dose levels represented 100 times the estimated daily intake of this substance in the human diet. The results were supportive of the safety of stevia extracts “when consumed as sucrose substitutes by human populations.” This “protracted and extensive investigation” found “no significant dose-related changes” in all areas examined. Two other studies of subacute toxicity, Kinghorn noted, also failed to predict any potential harm to humans from ingesting these extracts. Why haven’t these been given any credence? 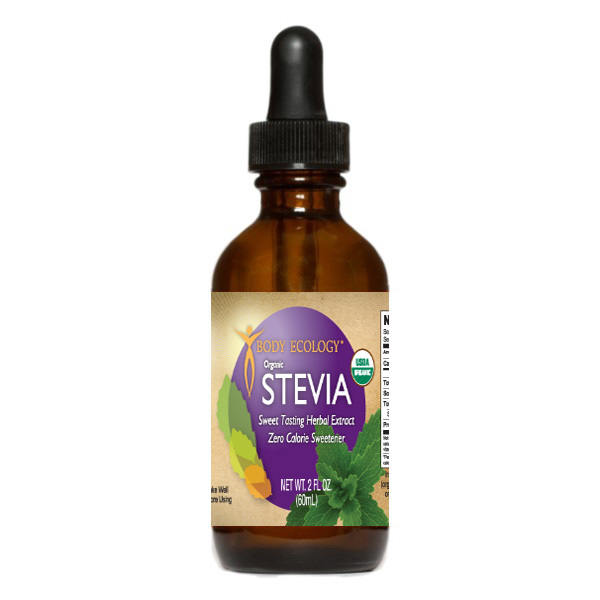 Many observers had hoped that the passage of the Dietary Supplement Health and Education Act of 1994, which exempts certain ingredients in vitamins and supplements from strict FDA review, would be stevia’s savior, allowing the herb and its many benefits to be introduced to the general public. But even though several companies are now marketing stevia and its extract as a dietary supplement (see box, page 62), the FDA has not let the matter drop. In the meantime, proponents continue to promote the herb through a stevia underground. Donna Gates, for example, author of The Body Ecology Diet and a passionate believer in the plant’s curative powers, says she’s willing to go to jail, if necessary, to champion her cause. “There are so many plants on the planet that are given to us to use to be healthy, and I believe stevia is one of those plants,” says Gates, who despite the FDA’s actions has been openly selling stevia extract as a sweetener. Gates, in fact, sees a grassroots movement among natural-food advocates starting to take shape on this issue-a kind of tea-rescue mission infused with the same spirit of resistance that the American colonists displayed in dumping tea into Boston Harbor. “A lot of teas are using it,” she alleges, “but they just say natural flavors.” And now that the Dietary Supplement Act has “brought the industry together and made it very strong, everybody would organize” against a continued FDA attempt to keep stevia off the market. While such talk may be overly optimistic, there are developments that suggest that stevia will indeed become far bigger than it is today-though not here in the United States. In Canada, where stevia can be sold as a tea (but not as a sweetener), a Vancouver company, Royal-Sweet International, is in the process of developing a stevia-based sweetener for which it acquired a global patent several years ago. The company isn’t waiting for Canadian or US approval of its product; it intends to direct its efforts at the fast-growing Asian market for stevia extracts. Perhaps most significantly, the project has been undertaken as a joint research venture with Agriculture Canada, a government agency, which sees the herb as a potential high profit replacement for Canadian tobacco. A similar idea was recently suggested by the ambassador from Paraguay as a means of curtailing his country’s cultivation of marijuana. In a letter to various members of Congress and others asking for their help in loosening the import restrictions, the ambassador noted that growing stevia is an idea strongly supported by the US Drug Enforcement Agency. The ambassador apparently failed to see the irony of the fact that another agency of the US government has proclaimed stevia to be an equally forbidden substance. Copyright 1999 by Linda Bonvie. I tasted the plant , and I found it to be good. It is natural . if not prepared with bad ingredients.